It is hard to capture the inner life of a reserved person. The viewer must be content with their physical actions that might not make sense since we do not know what they are thinking. Charulata is about a reserved Bengali house wife in the late 1880s who discovers her talent for writing after she falls in love with her husband’s cousin. It is easily one of most fascinating portraits of a woman trying desperately to hide her feelings. Charulata is married to a well off Bengali. He is intellectual, sensitive and always willing to help his family out. He is also distracted by putting out his English language political newspaper that he runs out of the house. He devotes almost all of his time to this venture, writing, editing and printing the news for the unwashed masses. This leaves Charulata with a lot of free time. She is incredibly smart, loves books and has a talent for writing very good letters. In order to provide her with some entertainment, her husband invites her brother and his wife to come live with them, putting the brother in charge of the finances of the newspaper. The wife turns out to be dull company, with little to stimulate Charulata out of her perpetual boredom. One day, the husband receives a visit from his cousin, Amal. Amal asks to live with them for a little bit and the husband eagerly agrees. He also charges Amal with a task in exchange for free room and board. He must stimulate Charulata’s literary leanings. This is especially fitting because Amal is a poet. Charulata and Amal start to have these long and winding talks about books and about writing. When Amal gets published in a magazine, Charulata takes it as a dare and decides to submit a piece to a magazine of her own. She gets into the magazine with seemingly little effort. Through songs, swinging, and talking, these two people grow closer and closer. Meanwhile Charulata’s brother and his wife leave suddenly for a vacation. 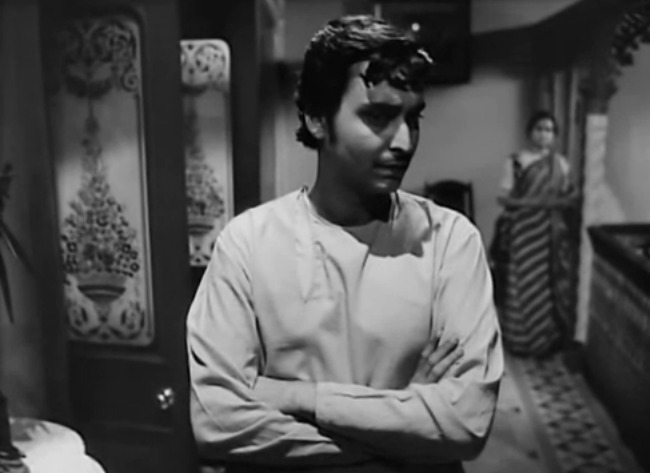 While he is gone, Charulata’s husband realizes that the brother has been stealing from him and from the company. His baby is now finished. No more paper. Charulata floats an idea past him asking for a split down the middle. Half news and half literary journal. As they hurry back to flesh out this amazing idea, they find that Amal has gone. This breaks Charulata’s heart and she cannot control her reaction. Her husband understands instantly and leaves. Eventually he comes back and they stare at each other over the threshold of their doorway. This film isn’t just about one woman’s temptation, but about the life of a woman in general during this time. A respectable Indian wife isn’t able to go out in public alone. Idleness is a status symbol but it can also be a heavy burden to bear. There must be some outlet of creativity or the mind slowly dies. Charulata may have packaged her feelings for her cousin in law in with her writing abilities, but she was never taught how to feel like a mature woman. For example look at her sister-in-law that comes and stays with them. She shamelessly flirts with Amal in the hallway for all to hear, she can’t seem to focus on anything and is more interested in exposing Charulata’s secret than tending to her own husband. In other words, she acts like a teenager. And I am sure that she is the more typical example of an Indian wife during this time. But Charulata has grown up thoughts and feelings. She has a mature sense of compassion for her husband that extends beyond that flitting crush she has on Amal. I loved this movie because it is the classic example of understatement being key in gripping drama. There is no penultimate love scene between Charulata and Amal and there is no out right exclamation of feeling. Instead nonverbal tell it all. Charulata choosing to make Amal his paan over her sister-in-law or switching from embroidering a pair of slippers for her husband to Amal shows her feelings shifting towards Amal. Ray was the master at hinting and juxtaposing images to one another to suggest a more complex relationship. The best example of this juxtaposition would be the iconic scene where Charulata is swinging in the background while Amal is composing a poem. She seems to be swinging right above his head in the shot. In this one shot you understand that Amal is getting inspiration from their relationship and Charulata is invigorated with possibility. It is a great shot in an amazing movie.